As you would probably know, you have to pay a monthly bill for Magento’s Go edition, an annual fee for the Enterprise edition and nothing for the Community edition. So, something that can make you think for long while figuring out the Magento edition right for you can be the free open source choice. If open source is something you are not familiar with, the price point can be deceptive. You can have the code at no charge, but it is as if you have a blank canvas on which you have to paint a picture yourself. To do that you often have to acquire add-on technology or services which are not free. The benefit is that you can build your web store to operate and look the way you like. However, you have to customize it yourself or pay someone else to do that. So, the total cost of ownership can be as much as or more than the Enterprise edition. It is true though that the Community edition can be the best choice if your implementation is rather simple. You have to ensure security and hosting for your store as the Community edition is a downloadable solution. You have to obtain PCI compliance before launch for security. Existing users may also have to install patches to cover vulnerabilities in the framework of the software. Management of orders – You can use the admin panel to create, view, edit and fulfill orders. Allow for split fulfillment by creating one or many credit memos, shipments and invoices. Tools for marketing and promotion – Create flexible pricing rules and restrict these to categories, stores, products, time periods and customer groups. Customer accounts – Provide access to recently ordered items, downloadable products and re-orders from account. Reporting and analytics – Access a best customers report by the number of orders, an abandoned shopping cart report and an admin dashboard for overview of reports. Customer service – Magento offers customer accounts rich in features and customers can track their orders from their accounts. Search engine optimization – You have Meta information for categories and products and control of URLs through URL rewrites. Google site map is also available. Payment – Magento supports several options for payment. Magento Connect provides payment extensions and you can configure capturing and authorization of funds. Site management – There is one admin panel from where you can control several stores and websites. Easily integrate Magento and any third-party application through a web services API. Multivariate and A/B testing is also available. Shipping – Offer free shipping, several shipments per order and shipping to many addresses in one order. Management of catalogs – There are advanced pricing rules and special prices are supported. Magento offers downloadable/digital products, Google base integration and batch import and export of catalog. Checkout – Provide shipping to many addresses in one order, along with guest checkout/checkout without account and one-page checkout. Catalog browsing – There is layered/faceted navigation for filtering of products in search results and categories. Product reviews and comparisons are also there. International support – Magento offers support for nearly all currencies and many languages. Mobile commerce – There is support for native applications on iOS and Android and you can also create a storefront easily for apps based on HTML5. The interface also supports the Mobile Opera browser. Product browsing – You can provide a number of images for each product and the capability to zoom in on product images. When would you need Magento Community Edition? This is good for you if you are a developer or tech-savvy merchant with less than 50,000 unique visitors a month. 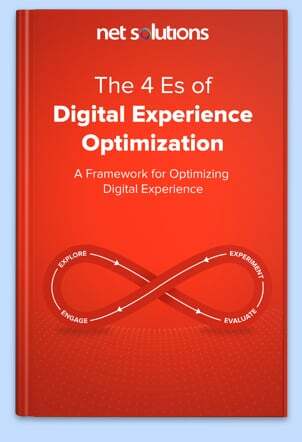 Magento provides no support for this edition. You can transact with consumers but you require third-party add-ons for transactions with other businesses. Strong key management, hashing and data encryption – You can easily manage and update database keys. It provides strong hashing on the basis of SHA-256 and strong data encryption on the basis of AES-256. Rich merchandising suite – Use specific values or characteristics of customers to identify specific customer groups and optimize marketing initiatives for them. Convert browsers into buyers by targeting them with special promotions. Payment Application Data Security Standard (PA-DSS) payment bridge/certification – Achieve PCI compliance with minimum effort and cost as Magento Secure Payment Bridge is PA-DSS certified. This lets customers save their credit card information securely for transactions in the future. Product relations based on dynamic rules – Use the specific product selections of customers to present related products, cross-sells and up-sells to them. Utilize a condition-based tool to easily administer rules to manage banners, shopping cart price rules and specific product suggestions to encourage additional purchases. Alternate media storage support (database and CDN) – Store media files in CDNs or the database. Continual shopping – Customers can maintain items they find interesting in their recently compared items, shopping cart, recently viewed items and wish lists between different devices and browsing sessions. They don’t have to log in again to view their shopping carts’ contents. This is done though long-term cookies for the various device/browser combinations. Configurable widget for order tracking – Customers don’t have to log in to their accounts to track the status of returns and existing orders. Automation of email reminders – Customize and configure email reminder campaigns for quantity, cart value, frequency, etc., for customers with abandoned wish lists and shopping carts. Full-page caching – Reduce load and improve server response times through caching of pages such as product and category pages for all users. Private sales – Create events and invitations for limited time sales for specific customers. Solr search – This improves the relevance, quality and speed of search results for customers through features such as weighted attributes and synonyms/spellings/stop words. It offers an alternative to the standard search for Magento. Gift registry – Customers purchasing gifts can search for the registry by gift registry ID, email or owner’s name. The feature includes privacy settings. Archiving of orders – You can configure a period of time after which to archive orders regularly so as to enhance performance. These orders are still available to customers and administrators. Options for gifting – This feature lets your customers buy virtual and physical gift cards/certificates for your store. You can provide options for gift messaging and gift wrapping, before check out, to increase the average order value. Administrators can easily configure the taxes and pricing applicable for the gift wrapping options. Purchase permissions and category view per customer group – Control access for purchasing or viewing items by specific customer group. Rewards points – Increase customer loyalty and provide incentives to frequent buyers by implementing rewards points programs. Conversion rate, balances, customer history and expiration are among the parameters that you can use to control redemption rules. Administrator action logging – This feature allows review and tracking of all actions such as information deletion, edits and views by administrator users. You can view logs associated with specific users. Store credits – Create and associate store credits with customer accounts. Use these to refund orders. You can also use virtual gift cards to be redeemed against future purchases for the purpose. Promotion and price permission – Create a number of admin roles for reading and editing promotions and prices. Several wish lists – Customers can save products to a number of wish lists and move or copy items from one list to another. They can make the wish lists searchable by any one by making them public. You can review the wish lists to learn about your customers’ requirements. Restriction of access roles – Administrators can restrict access roles so that only the data relevant to staff can be visible to them. Addition to carts by stock-keeping units – You can simplify ordering based on offline catalogs, recurring orders and large orders by letting customers enter stock-keeping unit lists instead of going into product pages. This can streamline the process of ordering, particularly for B2B customers. Management of customer attributes – You can create customer profiles and customized marketing campaigns by using the Magento administrator interface to manage customer address and account attributes. Return management authorization – Administer returns, including partial order and individual item returns, besides shipping methods and customer notifications, among other things. Content staging, merging and rollback – Test new promotions, product information and categories by creating a staging site. Approve content to be merged with the live site. This can be done according to a schedule or on demand. Rollback content, if required. Content management system – Magento’s content management system supports rich content and uses a WYSIWYG editor. That makes it possible to create menus, develop complex content pages, restrict privileges for publishing and create several versions of pages. Store view en masse or individually, delete or copy different content management system hierarchy trees for each website and easily add content management system pages to the menu for navigation. Rollback and backup – Schedule and manage various backup operations. You have the option of reversing any modifications through rollback of changes. Media backup, database backup and system backup are supported. Test new customizations or modules through this feature. When would you need Magento Enterprise Edition? This is suitable for you if you have a mid-to-large sized business with more than 25,000 unique visitors a month. Magento provides full support, warranty and indemnification for this edition, along with code-level access. Full business-to-business support is natively available. The Enterprise edition has a faster process of indexing, provides better support for international businesses, has a faster checkout, has more flexible sales and promotion features and handles a larger number of products than the other editions. The edition provides you with continual improvements in architecture and the ability to support growth by scaling accordingly. There also is a robust service level agreement to make you feel safe. It is a hosted solution and its monthly billing is based on bandwidth, the number of stock-keeping units, amount of storage, number of languages and the number of admins. As a store owner, you can get an idea, ahead of time, of the products that may be sold as there is a ‘products in cart’ feature. It lets you see the products customers add to their carts. The ‘abandoned cart’ feature helps you increase conversions and regain lost sales by letting you see a list of abandoned carts. Magento Go lets you add custom polls to your online store to enhance engagement with customers through a very simple method. You can easily access the poll questions and answers. Magento Go provides you with a good selection of store currencies and languages. You can sell in nearly all currencies as the shopping cart is integrated that way. However, the number of available languages may vary based on the plan you select. You can use both simple and advanced editing to customize the store. The shopping cart is Payment Card Industry (PCI) compliant. There are unlimited options such as size and color that you can add to each product. There are a lot of apps that you can use to add additional features. Control landing pages, Meta information and URLs through the in-built feature for search engine optimization. ‘Tell a friend’ and social sharing buttons are provided. Create promotional banners, coupons, gift cards and discounts. Magento Go is integrated fully with real-time shipping rates from leading carriers. There are advanced analytics and reporting tools. You can enable one-page checkout, store credits and guest checkout. There are more than 20 methods of payment including gift cards, PayPal, money orders, checks and Authorize.net. Magento Go provides more than 30 free templates. You can also buy custom templates. Template editors are provided for customizing all templates. You can change to a custom domain from the default URL and also redirect your store to a custom domain. Magento provides support through email ticketing, live chat and telephone. When would you need Magento Go Edition? This edition is suitable for you if you have a small business with less than 10,000 stock-keeping units and simple items with no matrix pricing. It is also useful if you find it easier to take on an operating expense rather than to fund a capital investment. 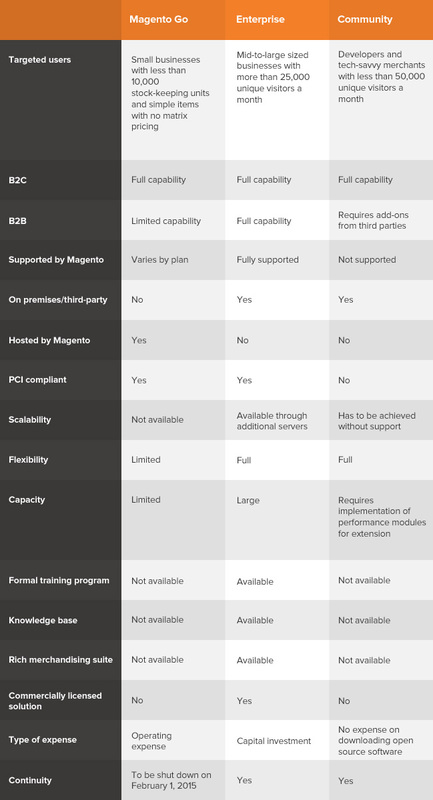 As a Magento Go customer, you are entitled to support, but the level varies by the plan you choose. The Go edition is good for you if you sell to consumers, but has limited capabilities for business-to-business sales. 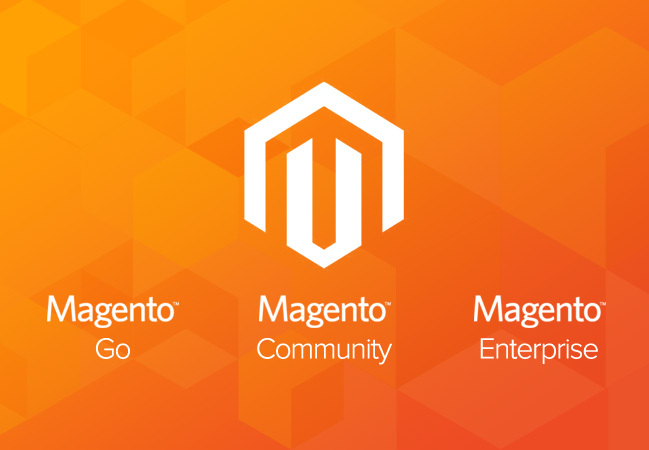 Note: Magento has decided to shut down Magento Go on February 1, 2015. How Do You Know If This is The Right Time to Upgrade from Community or Go Edition to Enterprise? You need a clear picture of the way in which you want your web store to grow and a look in depth at the state of your ecommerce environment to be able to answer this question. Determining the functionality and features you want to see on your store and implementing the upgrades required to achieve your goals is more important than determining a “level” to reach to decide the ideal time to upgrade. Scalability – The performance of your website will be reduced due to a surge in traffic, if you have not equipped your web store for handling large activity volumes. So, if you are facing such a problem while using the Magento Go or Community edition, you can switch to the Enterprise edition to rectify the problem.It processes customers quickly and knows when additional resources are required for maintenance of performance. Magento provides additional production servers for customers of this edition so you can scale easily and don’t have to deploy additional and expensive hardware onsite. Also, MySQL query caching, Expires Headers and Magento caching are among the adjustments you can make without having to purchase additional server space or doing extensive customization. These will ensure that page data is served and stored in such locations that when a customer requests information, it is presented as soon as possible. Security – The Magento Community edition does not have the Magento Secure Payment Bridge that is available with the Enterprise edition. This implies that the Enterprise edition is PCI PA-DSS compliant and you don’t have to incur costs related to obtaining PCI compliance yourself.So, you can upgrade to the Enterprise edition when you want your customers’ personal information to be encrypted and securely stored according to international security regulations.The Magento Secure Payment Bridge lets you process partial refunds on orders placed through PayPal Payflow Pro, have potentially fraudulent transactions flagged automatically and access fraud management features for Authorize.net from the Magento administrator. Capacity – Your mid-to-large sized business will operate rather slowly on the Community edition, unless you implement a performance module, if there are a large number of visitors on your website. The Enterprise edition provides much larger capacity for handling large quantities of product catalogs, order submissions and online traffic. On account of full-page caching, the Magento Enterprise edition can provide fast page-load times even when there are thousands of visitors simultaneously.However, it is significant to remember that it is generally not a good idea to launch or re-launch your website during the holiday shopping season or another such high-traffic period. You will cause minimal disturbance to customers while making upgrades or adjustments if you select a low-traffic period, while observing how your site responds to traffic. Cost – If your business has the technical resources to develop and manage your site in-house, it can be a great benefit to launch it using the Magento Community edition, especially if you don’t have the capital to buy a commercially licensed solution. 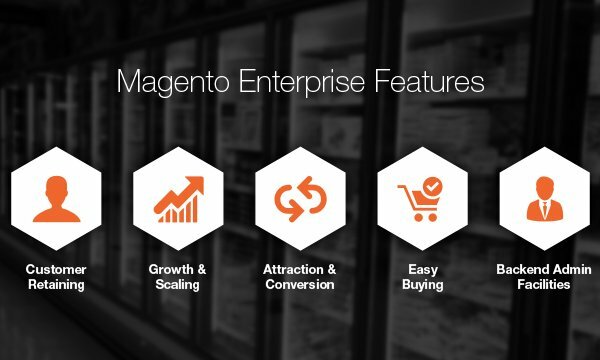 However, the total cost, including hosting, customization, extensions and integration with third-party applications, among other things, can grow with time.With the Magento Enterprise edition, you get scalability, performance, stability and many exclusive features, besides the flexibility of the Community edition’s open source foundation. So, you should review the total cost of ownership often and switch to the Enterprise edition when appropriate. Support – While Magento offers no support for the Community edition and limited support for the Go edition, it offers full technical support for the Enterprise edition. Magento’s support staff serve as an extension of your IT department when you have Magento Enterprise.With the Enterprise edition, Magento provides a knowledge base of educational material, literature, success stories and best practices, in addition to a formal certification and training program on the Magento environment. So, if you require a team of certified specialists, want to lower costs for support or lower the burden on your IT staff, you can upgrade to the Enterprise edition. 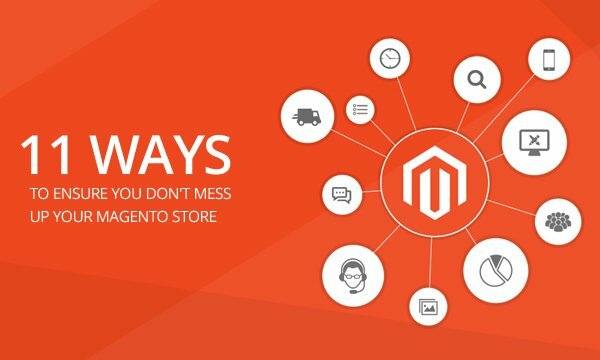 If you run a small business and are looking for a hosted solution with limited support, for ecommerce, then Magento Go can be a good option for you. However, Magento has decided to shut it down on February 1, 2015. If you are a developer or a tech-savvy merchant looking for a low-cost ecommerce option, Magento Community edition can serve your purpose. 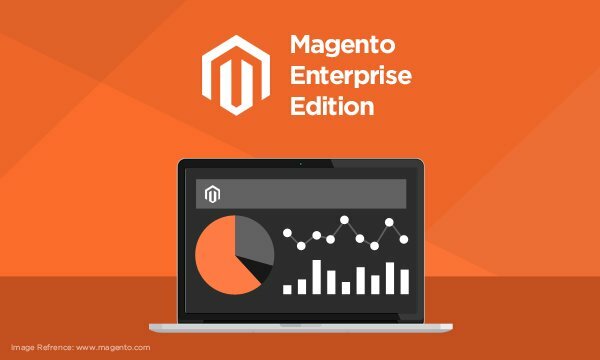 However, if you have a mid-to-large sized business and require an out-of-the box, fully supported ecommerce solution, then the Magento Enterprise edition is appropriate for you. Read this blog post to evaluate which Magento edition is appropriate for your ecommerce website.